South Africa is looking to boost trade ties with India, ahead of the 5th BRICS Summit in Durban in March this year. The announcement was made at the 4th Investment Initiative by South Africa’s trade ministry to India. “Trade between the two countries has received a lot of attention over the past few years. The rationale for this is rooted in the enhancement of South-South economic integration and cooperation,” said Elizabeth Thabethe, South Africa’s deputy trade and industry minister. “India’s economy presents enormous trade and investment opportunities for South African businesses,” said the minister, asserting that South Africa considers India to be a strategic partner. Thabethe was addressing a seminar attended by businesspeople from South Africa and India at the Taj Palace Hotel in New Delhi on Monday. 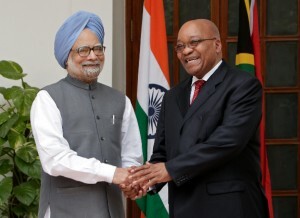 India and South Africa are key allies in advancing the South-South trade interests. The minister was due to open an exhibition by South African companies today, and to pay a courtesy call on her Indian counterpart, Daggubati Purandeswari. According to South Africa’s department of trade and industry (DTI), companies that took part in similar missions to Mumbai and Chennai in March 2012 secured new business. DTI said the companies had interactions with 600 potential buyers during which 144 trade leads were generated, three agents or distributors were appointed, and export orders to the value of R28.2 million were successfully negotiated. Trade between the two BRICS nations had almost trebled from R16.3 billion in 2007 to R61.65 billion in November 2012. Targeted sectors include agro-processing, metals beneficiation, mining technology, and automotive component manufacturing. “The realisation of these opportunities should and must be anchored on the necessary support to small and medium enterprises as true drivers of the economy,” she said. South Africa is looking at foreign direct investment and joint venture partnerships in pharmaceuticals, Information and Communication Technology (ICT), energy, manufacturing and infrastructure.